Why do every day leftovers feel so “meh” and other leftovers so “to die for”? I mean, why does the roasted chicken from two nights ago sit in the fridge waiting to be repurposed, but roasted Thanksgiving turkey gets devoured? I my gluttonous life, I am so anxious to eat Thanksgiving leftovers that I sometimes eat dinner twice on Thanksgiving. But that sautéed broccoli from last night’s dinner? Sometimes it sits, and sits, and sits. When I was just out of college, single, and a horrible cook, my mom used to come visit me and cook up a storm while I was at work. Then, she’d package these little homemade meals for me in the freezer. Those little plastic containers, stacked in my fridge, were like gold in my world. I mean, who doesn’t want a home made meal from mom after getting home from work at 11pm? I especially remember my mom’s signature curry — which freezes beautifully. Re-heating those frozen meals sent a created a cozy blanket over my little apartment and left it smelling like my mom was right there cooking one of my favorite meals. For me, it’s the flashback effect that makes some foods so special, worth saving for weeks, or even months in the freezer for the right moment to re-heat. I mean, who really wants to eat 4 month-old chicken curry? I do. When it’s my mom’s. I save it. I hoard it. And when I eat it, I’m transported to my childhood dinner table. My sister is next to me, and we are eating this delectable curry over white rice with guiltless abandon (it was before we cared or even knew about brown rice, sodium, or calories). Yum. Even today, I savor my mom’s curry because embodies the tastes, aromas, and emotions of family. Saving special foods, especially the foods that are hard to get, can transport us to bygone days. Now, it’s August and I can feel summer slipping away. It’s like a race against time to pack as many beautiful cherries, berries, peaches, and plums into my body as possible. I’m tossing summer fruits into salads, oatmeal, cereal, yogurt, smoothies, and of course, desserts. Last week, when I was visiting my mom, our kitchen roles came full circle as I created these freezer friendly peach-berry hand pies for her and her fiance. It’s hard to resist baking and eating all of these at once, but freezing them allows you to savor the tastes of summer even after your favorite summer fruits are no longer in season. Pull out some of these from the freezer, pop them into the oven, and serve them in the middle of October. Blueberries in October? I think it’s better than Christmas in July. 2 cups fresh berries of your choice, rinsed and drained (I used one cup of blueberries and 1 cup of blackberries, but you can use any berries of your choice. If you use strawberries, they should be hulled and chopped). Make the crust. Place the flour, baking powder, and salt in a food processor and pulse 5-7 times to mix the dry ingredients. Add the cream cheese to the bowl and pulse 8-10 times or until the mixture looks like a coarse meal. You can also do this manually with a pastry cutter. Then, add the frozen butter chunks and pulse another 10-12 times or until the butter is a little larger than the size of peas. Add the water and vinegar and pulse until the butter is the size of peas. If the dough starts to come together immediately (because you are making this in Florida and there’s 99% humidity) stop pulsing. Bring half of the dough together with cold hands. Knead the dough very gently until it is slightly pliable, then form into a small disc, wrap in plastic wrap. Repeat with the remaining half of the dough. Then refrigerate the two discs for at least 45 minutes or overnight. Make the filling. In a large bowl, combine the fresh fruit, lemon juice, cinnamon, sugar and flour. Make sure all of the fruit is coated evenly with the sugar, flour, and cinnamon. I only used ¼ cup of sugar because my fruits were very sweet and my dear husbanders prefers his desserts that are not cloying sweet. (If baking immediately, pre-heat the oven now to 375F) On a clean, lightly floured surface roll out the dough to about ¼ inch thick. If you refrigerated the dough overnight, you may need to let the dough rest on the counter for 10-15 minutes or so to let the dough soften up. Cut the dough into 3 ½ – 4 inch rounds. In the center of each round, place 2-3 tablespoons of fruit filling. With your index finger, run a little bit of egg wash on the edges of round, then fold over the dough to make a semi-circle. Press the edges lightly with a fork to seal the hand pie. On the top of the pie, gently slit the dough to allow the pie to vent. TO FREEZE (and save for later! ): Place the hand pies on a cookie sheet lined with parchment paper. Place the pies into the freezer overnight. Don’t worry if some of the juices are running out, after the pies are frozen, you may place the pies in a zip lock bag and keep the pies in the freezer. Freeze for up to 4 weeks. When you are ready to bake, there is no need to defrost, just follow the steps below, but bake at 350F for 28-35 minutes, or until the pies are golden brown and the juices are bubbling. IF BAKING IMMEDIATELY: Lightly brush the egg wash over the pies, and sprinkle with the raw sugar. Place the pies about 2 inches apart on cookie sheets lined with parchment paper or silicone baking mats. Bake for 25-30 minutes at 375F or until the pies are golden brown and the juices are bubbling. Let the pies cool on the parchment or baking mat on a wire rack. Once the pies are completely cooled, serve, preferably with some vanilla ice cream! This is a perfect dessert to serve after #SundaySupper. 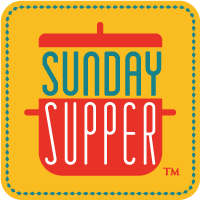 Look at at all of these wonderful recipes and ideas for saving summer from others in the Sunday Supper Group! What is your favorite way to save summer? ¼-1/2 cup sugar, depending on how sweet you want your filling, and how sweet your fruits are. Place the flour, baking powder, and salt in a food processor and pulse 5-7 times to mix the dry ingredients. Add the cream cheese to the bowl and pulse 8-10 times or until the mixture looks like a coarse meal. Then, add the frozen butter chunks and pulse another 10-12 times or until the butter is a little larger than the size of peas. Add the water and vinegar and pulse until the butter is the size of peas. If the dough starts to come together immediately stop pulsing. Bring half of the dough together with cold hands. Knead the dough very gently until it is slightly pliable, then form into a small disc, wrap in plastic wrap. Repeat with the remaining half of the dough. Refrigerate the two discs for at least 45 minutes or overnight. In a large bowl, combine the fresh fruit, lemon juice, cinnamon, sugar and flour. Make sure all of the fruit is coated evenly with the sugar, flour, and cinnamon. On a clean, lightly floured surface roll out the dough to about ¼ inch thick. If you refrigerated the dough overnight, you may need to let the dough rest on the counter for 10-15 minutes or so to let the dough soften up. Cut the dough into 3 ½ - 4 inch rounds. In the center of each round, place 2-tablespoons of fruit filling. With your index finger, run a little bit of egg wash on the edges of round, then fold over the dough to make a semi-circle. Press the edges lightly with a fork to seal the hand pie. On the top of the pie, gently slit the dough to allow the pie to vent. Place the hand pies on a cookie sheet lined with parchment paper. Place the pies into the freezer overnight. Don’t worry if some of the juices are running out, after the pies are frozen, you may place the pies in a zip lock bag and keep the pies in the freezer. Freeze for up to 4 weeks. When you are ready to bake, there is no need to defrost, just follow the steps below, but bake at 350F for 28-35 minutes, or until the pies are golden brown and the juices are bubbling. Preheat oven to 375F. Lightly brush the egg wash over the pies, and sprinkle with the raw sugar. Place the pies about 2 inches apart on cookie sheets lined with parchment paper or silicone baking mats. Bake for 25-30 minutes, or until the pies are golden brown and the juices are bubbling. Don’t worry if the juices are running over. Let the pies cool on the parchment or baking mat on a wire rack. fantastic!!! I’m going to be making these before the summer is over too! thanks for sharing! These would be perfect to keep on hand for an easy summer treat! Oh my … these sound absolutely scrumptious! And I love that there’s cream cheese in the crust! These sound wonderful with ice cream! Peaches and berries? Yes please! Those pies sound delicious! I have never heard of a cream cheese crust before, but I want to try it! Love that you shared such wonderful food memories and I am in love with these hand pies!! Wow! Did I read that right? You are in Morocco? Anyhow, how wonderful to have such a loving mom who stacked up your fridge with goodies. And how very special that you were able to reciprocate with these gorgeous hand pies…P.s. Many thanks for the intro to the cream cheese crust…I’d like to give it a try -soon! I split my time between Morocco and Washington, DC. I’ve been in the US and Canada visiting family and friend the last couple of weeks. Let me know how you like the cream cheese crust! I sure wouldn’t mind having a few of these in the freezer to take out for breakfast! It definitely beats a regular pop-tart! These are great for impromptu brunches too. Lovely hand pies and the combination of peaches and is perfect!! Thanks Tara! I LOVE summer peaches, but really how can you go wrong with any summer fruit in a pie? Oh these look so rustic and lovely. Just seeing the juices running out gives the big clue of the freshness of the berries and fruit inside. I just wish we could get fresh berries like this year-round! Yummy! I love the idea! Nothing like homemade hand pies! Yummers!! I had never tried freezing them in advance, but I’m so glad I did! These are absolutely fabulous, Ethel! I love that you baked them for your mother too. It’s so nice to be able to return the many favors they did for us when we were younger. Thanks Stacy! I love cooking with and for my mom. I just wish we lived closer together. It’s fun to learn her old standby recipes and to give her tips for making them just a wee bit healthier!